I’m about to share with you the 12 Days of Shopping Local #5, but first, a bit of housekeeping. It came to my attention that the link I shared a few days ago for the winter edition of the Old Oaks Journal (which includes information about winter activities sponsored by the Madison County Conservation Board/Madison County Parks) did not work properly, so let’s try that again. Click here for the winter, 2014 edition of the Old Oaks Journal. Outdoor activities are in keeping with the spirit of this post anyway, because we’re heading over to the gift shop at the John Wayne Birthplace for Christmas gifts inspired by the Duke! Until it moves to its new site, the gift shop remains open at 216 S. 2nd St. The previous post in this series (Angel Wings & CT) was geared toward the female recipients on your shopping list, but this location balances that out with some great items for men. In fact, the John Wayne Birthplace is probably our biggest local outlet for man cave decor. … clocks, license plates, calendars, and posters. … and this is the best-selling mug! The John Wayne Birthplace gift shop carries some items created by local artists Patti Farr and Larry Young, as well as books by local author Dave Freligh. They also have every current book on John Wayne, as well as every movie that is available. And if you’re just not sure what the John Wayne enthusiast on your list would like, you can always opt for a gift certificate. It’s hard to feature just five items from this location, because there’s so much! You can browse the majority of items for sale on the Birthplace Shop page of their website, and you can purchase and ship items online, too. Many folks around the world take advantage of this option. In fact, the same day I was there visiting, they shipped orders to the U.K., Ireland and Australia. Gift certificates can be used for merchandise or tours. That’s about all for now, but before I go, here’s an interesting tidbit that Carolyn shared with me. During a recent visit from a tour group, there was a man milling around the shop that the staff thought was the driver of the group’s bus. However, as he kept piling more and more things on the counter to purchase, they started to wonder what his story might be, and how he was going to get all those things home! As it turned out, he was not with the bus tour at all. He was the owner of the new Pizza Ranch franchise, and he was purchasing John Wayne items to decorate the new restaurant, set to open on December 15th. 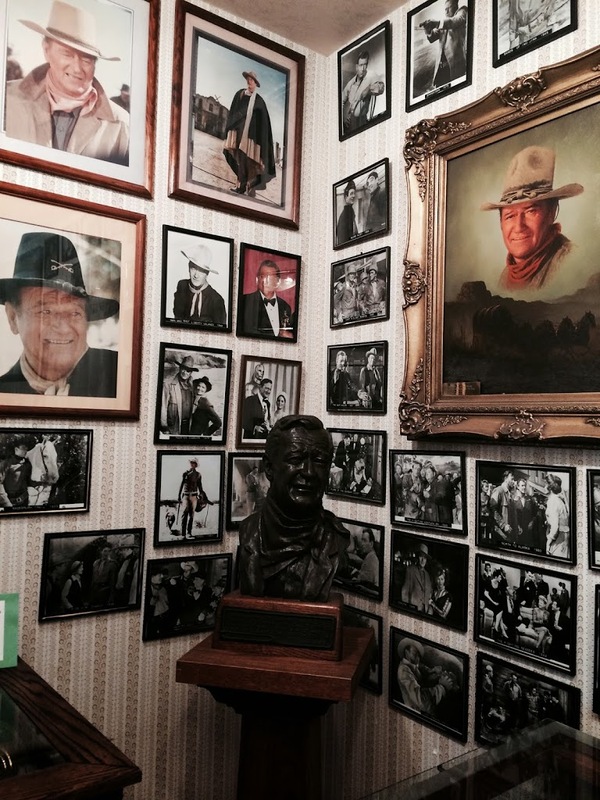 A John Wayne themed Pizza Ranch in Winterset– how cool is that?! Thank you for reading The Winterset Citizen and the 12 Days of Shopping Local! “On the fifth day of Christmas, my true love gave to me… five John Wayne things!